"The secret to this recipe is the grated eggs, which adds creaminess to this simple salad, finished off with sweet onion vinaigrette. It is sure to become your salad go-to!" Dressing: In a small bowl combine apple cider vinegar, honey, onion, mustard, salt and pepper. Slowly whisk in oil. Set aside. Salad: Finely grate or chop 2 eggs; slice remaining 2 eggs. 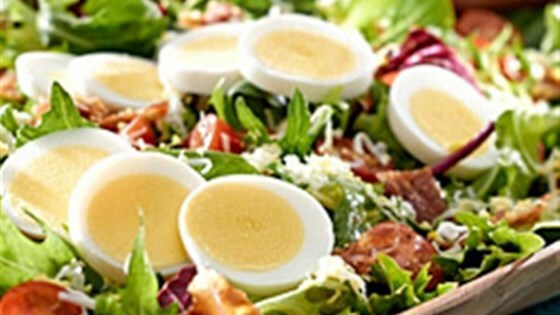 In a large salad bowl, combine greens, tomatoes, bacon and grated eggs. Toss with dressing to coat and garnish with remaining egg slices. Serve immediately. Croutons, crispy bacon, and a creamy dressing! This salad has the BLT beat. Sliced mushrooms, apples, diced avocado, and toasted sunflower seeds would be delicious additions to this salad. Just made the dressing so far- it's awesome! I used an immersion blender and so it's smooth and delicious! I used about half as much olive oil as it asked for. This was delicious; both the salad mix and the dressing; my husband also loved it as well. We will make it again for sure.